I saw that on the news this morning, terrible. The reporter did say that KCFD was impressed that nothing was collapsing in on them and credited with the construction methods of the building. Hopefully it can be saved. A devastating loss in the fabric of historic kansas city. 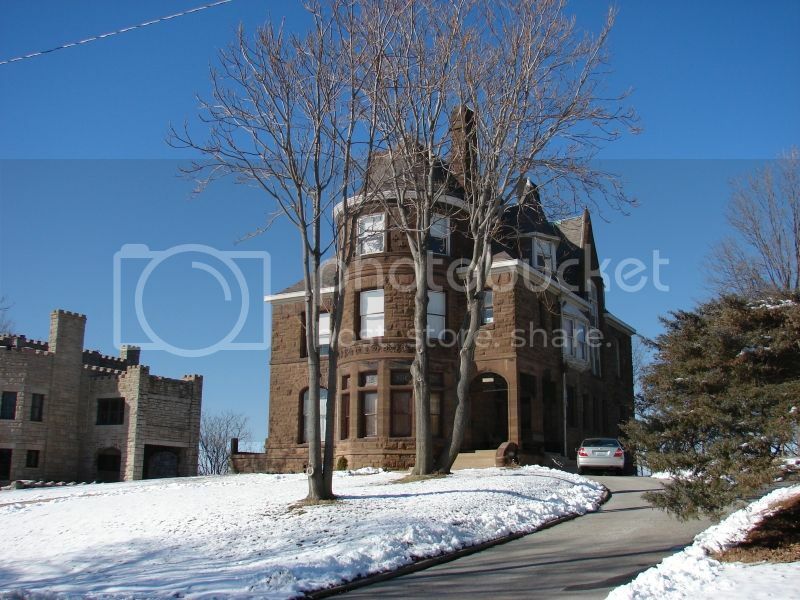 This home was designed by John Wellborn Root, who also designed the original Board of Trade, also lost to history. Is there a name for this home or any more history one might be able to dig up?!? It has always been one of my favorite homes in the city. Yes. And this home was one of the few on Gladstone that was finally returning to it's former glory, with untold amounts of money poured into it and the accompanying carriage house and landscaping. Amazing that the urban fabric in Northeast just continues to deteriorate, even in the case of a rare successful large restoration such as this. So sad. The link below shows the restored interior of the home. Just in the 7 years I've lived in the Historic Northeast, we have lost the Thacher School building to demolition; the Benton Theater to collapse; Gladstone Hall (Gladstone Theater) to fire; the retail and apartment building west of Snyder's Supermarket to fire; and the Vista Theater building directly across the street -- also to fire. Went by the house today. Dumpster and yard full of burned things. Saw there images on Historic KC's Facebook...looks like the house will be rebuilt after all! This development is part of the Paseo Gateway project. On Friday, October 28, the Historic Preservation Commission granted a Certificate of Appropriateness to demolish the vacant gas station at 2300 Independence Blvd. and make way for construction of the Pendleton ArtsBlock project, a four-story, mixed-used housing development. The housing project will include commercial uses on the first floor, facing south along Independence Avenue. Residential units will encompass the remaining three floors. In terms of outward appearance, the exterior is expected to consist of brown brick accented with lighter brick. 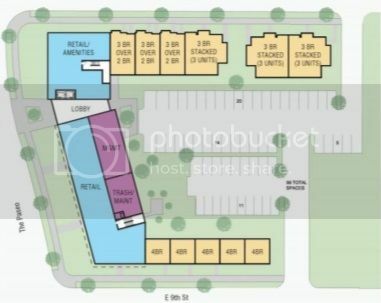 The first-floor store fronts are expected to be made of primarily aluminum (including in the windows and doors), with concrete forming the base. 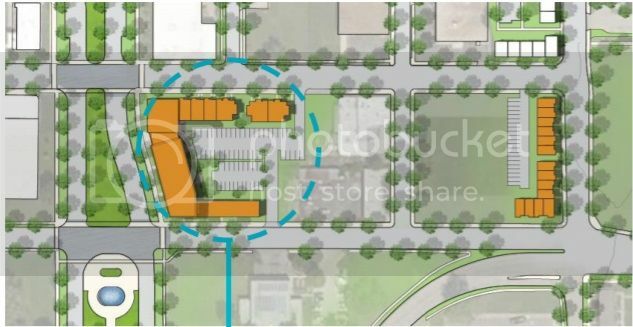 According to a staff report presented to the Historic Preservation Commission, the development will be visible from Independence Blvd., as well as Park Avenue and Olive Street. The site of the Pendleton ArtBlock development. Aerial of the parcel that includes the KC Tobacco Outlet (the gas station), and the vacant lot to the west. See Page 27 of this report for more information and parcel boundaries. 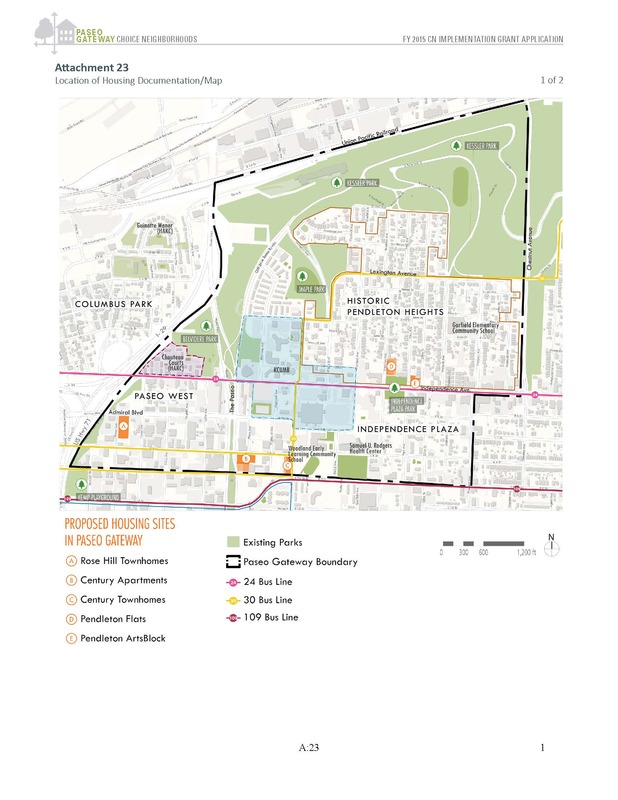 The ambitious plan to revitalize the Paseo Gateway area and increase the flow of traffic between the Historic Northeast and downtown Kansas City depends upon the razing of the Chouteau Courts housing project at 1220 Independence Avenue. Roughly 120 units of the housing project are currently occupied, and each of the tenants will need to be relocated before the razing and subsequent re-use can proceed. In total, the Housing Authority has made plans to relocate more than 100 tenants to five mostly mixed-income facilities throughout the city. Rose Hill Townhomes will be expected to house 33 low-income units; Pendleton Flats will host 10 low-income units; Century Apartments and Townhomes would welcome 28 low-income units; and Pendleton ArtsBlock would house 14. Some 25 low-income units have yet to be announced. The Rose Hill Townhomes development at Admiral and Troost is the closest to being move-in ready, with a completion date in early November. Nineteen applications have already been approved for qualified Chouteau Courts residents. From there, the renovated Pendleton Flats development off of Independence Avenue and Brooklyn is expected to break ground on October 30. Meanwhile, preliminary financing commitments have been obtained for Century Apartments and Townhomes (9th and Flora, 9th and Woodland respectively) and Pendleton ArtsBlock (Independence Ave. and Park), which is expected to become an incubator for local artists. The Century Apartments rendering--to be built facing Paseo Boulevard between 8th and 9th streets (east side of Paseo). Townhomes are also to be built on the west side of Woodland between 8th and 9th streets. Map showing location of the new development. The Pendleton Flats on Brooklyn just north of Independence Avenue will get a makeover and renovation. 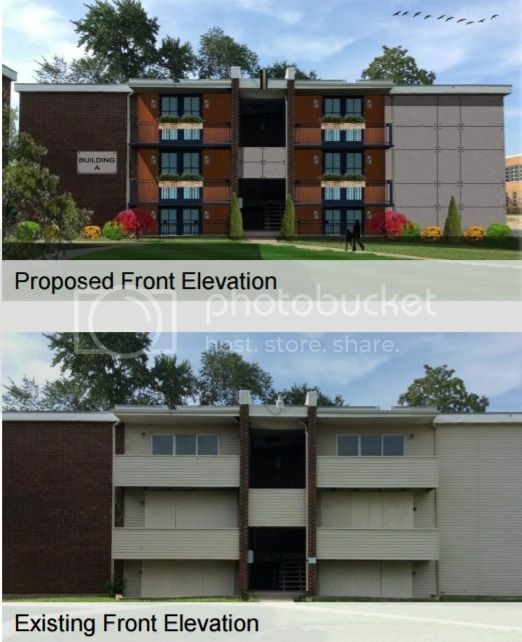 Well, I'm glad the Rose Hill Townhomes didn't set a precedent for awful design and retaining walls. All of those renderings look pretty good. TheBigChuckbowski wrote: Well, I'm glad the Rose Hill Townhomes didn't set a precedent for awful design and retaining walls. All of those renderings look pretty good. I'm actually a bit shocked, looks nice. Osteopath University to tear down a colonnade complex of 5 buildings facing a courtyard. That doesn't seem like a great idea. Thats them. The school says they are in deplorable physical condition. It would be a shame to lose these classic colonnades, ones in a full courtyard arrangement are rare. Wouldn't they make great student housing? moderne wrote: Thats them. The school says they are in deplorable physical condition. It would be a shame to lose these classic colonnades, ones in a full courtyard arrangement are rare. Wouldn't they make great student housing? Maybe us raggers should seize the populist fervor if our times and start making petitions to protect these buildings. "Return the buildings to their past glory!"